"A carbon fibre chassis is at the heart of all McLaren cars." Rotherham was booming even before McLaren’s arrival generated stellar interest worldwide. But the supercar company set the seal on the borough’s best period in business for 15 years. Mike Flewitt, McLaren Automotive boss, showcases a carbon fibre 'tub'. A £50m carbon fibre chassis factory on the Advanced Manufacturing Park is set to open in November and the firm estimates it will pump £100m into the region’s economy over the first 10 years. This story features in Rotherham Roars, The Star’s celebration of the borough’s booming economy published Wednesday March 28. Mike Flewitt, chief executive of McLaren Automotive, said: “The region is where we will innovate and manufacture the lightweight carbon fibre chassis that are at the heart of all McLaren’s cars. 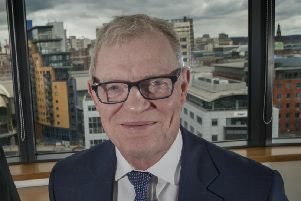 “Our decision to choose Rotherham and the Sheffield region means we can readily tap into the area’s proud association of working with advanced materials, the academic institutions and a skilled, dedicated workforce. McLaren is one of 28 investments in 2017 the council says add up to £133m - with more in the pipeline. Leader Chris Read, said: “The past year has been great for Rotherham. Everyone knows about McLaren, but we’ve also seen lots of other investments, ranging from companies newly locating in the borough to already-established firms expanding. Waverley, a housing site near the Advanced Manufacturing Park, is set for a £50m town centre and hundreds more homes, while 2,500 new houses could be built at Bassingthorpe Farm to the north west. University Centre Rotherham is under construction and Coun Read is “quietly confident” in the ‘Forge Island’ town centre redevelopment scheme after receiving interest from developers. Speciality Steels, which employs 850 in the borough, is thriving after a £100m takeover by Liberty House Group in May 2017. It has hired 300, is investing £20m and has been re-starting mothballed equipment.